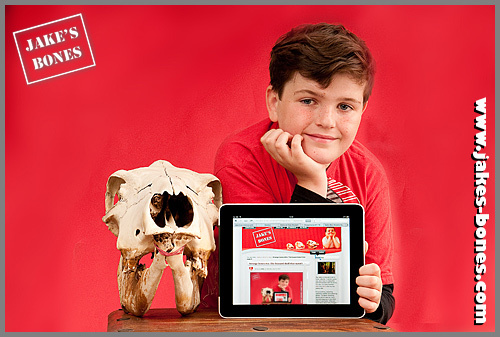 This is an unusual post for me because it's about blogging, not about bones. It was because I was thinking about the Times article which was yesterday, and thinking about what I would say to another kid about starting a blog. 1. Pick something good or strange to write about. I wanted to write about bones because it was something that only a few people are interested in, and writing a blog let me talk to those people who are all over the world. I think that if I had just written about something that more children were interested in it wouldn't be as popular, which sounds weird, but I think the more unusual a hobby is the more that you want to talk to other people about it, but it's difficult to find people who live close to you who like it too. 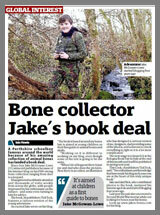 I don't just write about bones, but the other things I write about are other things that happened while I was collecting bones, like the red kite or deer stalking or the stoat, or exploring the ruined castle. It's still about bones, but it's fun to write about other things that are still related to it. It's really easy to start a blog for free on Blogger or Wordpress and it doesn't cost anything. But if you start a blog and just do what Blogger tells you to do you'll just end up with a blog that looks like everyone else's which is boring. You can find lots of designs for Wordpress or Blogger that look cool. The only money I have paid for my blog is about £7 a year for a personal domain name and I didn't even have that until a month ago. I am lucky that my dad is a photographer and he is good with websites. At the start he asked me how it wanted to look and what colours I would like it to be. He had spare rolls of background paper in his studio that were red, green pink and yellow, and he asked what colour I would like. 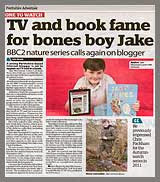 I said red so that is the background colour for a lot of the bone photographs and the photo of me at the top. My blog doesn't look like anyone else's and I like that. 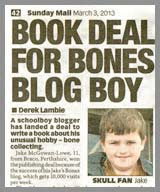 I called my blog "Jake's Bones" because I'm called Jake and I like bones. It is easy to remember. 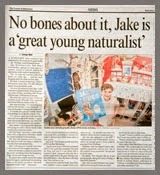 When I started I didn't know there was a story by the RSPCA called "Jake and Bones" and when I started if you googled "Jake's Bones" you got that at the top instead. Now my blog is the top link. 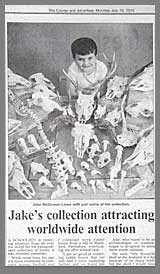 If I'd chosen a name like "Animal Bones" or "All about bones" it wouldn't be as interesting and it would be harder to find. I don't write like a scientist with lots of long words. When I look at skulls I don't use long words like premaxilla or other Latin words so I don't use them when I write. I try and explain as best I can for people who don't know a lot about bones. I make sure I get spellings right. Mum checks the post when I publish it and she spots things that I missed. If I make a mistake after I have published it I put a line through it and correct it lkie tihs like this just like when I do my homework. Sometimes we use Wikipedia to find Creative Commons pictures of animals we don't have pictures of, but not often. You can only use pictures on the internet if the person who took it says you can (or you can get in trouble like this blogger). If they are Creative Commons then they are letting you use it without asking, but you usually have to say the name of the person who took the picture. I have written every week for three years. It is something difficult especially when I want to do something else, but I am proud that I have kept at it. Once a week makes it easier to remember to do, and makes it easier for regular readers to check for new posts too. I used to worry about running out of ideas. Now I have about six or seven posts "in draft" which means they aren't published yet, but they have the pictures ready. That means if nothing happens on the walk that week I always have something to write about. Apart from writing posts, I spend about one evening a week catching up on comments and emails. I try to reply to everything. You won't get far if your Mum or Dad aren't interested. They can help with technical things like changing the design and adding things. They can remind you to write when you forget or want to do something else as well. Every six months dad and I sign an agreement (like a promise) that he will do the photos and other things as long as I write in my blog every week so that helps us both to keep up all the work. We go on walks together and he helps me with the posts. Mum reads it afterwards to make sure everything is right. In my first month of blogging I only got about 50 visitors. Now I get about 5,000 a month, and sometimes almost as many as 8,000. It's fun to look at your statistics, but don't worry about them for the first few months. Just because people aren't coming doesn't mean it isn't interesting. After 6 months I had 250 visitors a month. After a year I had about 1,000. After two years I had 2,500. One thing I really enjoyed adding was Flagcounter which shows all my visitors from all over the world. Blogger make it easy to add adverts but I never have. I want people to know that I only blog because I enjoy it. I get a lot of visitors from Google who find my blog for the first time. Dad added loads of things so they can be reminded to come back when I post. They can be a fan of the page on Facebook, follow it on Twitter, or get an email every time I post. It's nice when you have the same people coming back again and again and leaving comments. I read other blogs and leave comments there as well, and that helps other people find out about my blog. It's sad when you see an interesting blog that has stopped. It took me a while to write really interesting stories and know what people wanted to read. It can be hard if you think no-one is reading but I just enjoy writing for myself but I am glad if others like it too. There were loads of times I wanted to give up because I didn't want to sit down and do this weeks post but I still did it and I am glad I didn't stop. More kids should blog. There are loads of kids doing interesting things but not writing about it so no-one knows they are doing it. Hope this helps ! What other tips do you have ? I'm already planning my blog! Been in on the Isle of Mull in Scotland, bought a roe deer skull! 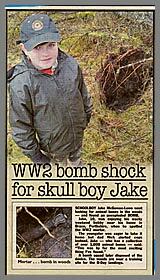 I'm coming up to Scotland tomorrow and hoping to find some bones! @microadam: like the design ! @Izzy: it'd be cool if you were allowed. Mum and dad were a bit nervous at first but they are fine now. @Jack: good luck bone hunting ! 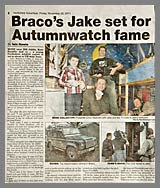 Jake, I appreciate all the tips! I recently started blogging about my bones that I find. This information is very useful and my mom and dad have been very supportive :) I love your blog so much and look forward to your weekly updates! Rock on! -Julia T.
website along with attractive and exclusive materials whatever you need. Where did Ardoch House go ? 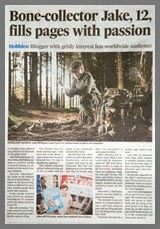 I'm in The Times today (with a video) !